Strabane, a town straddled on both sides of the River Mourne by two bridges has seen many transformations throughout the centuries. The town is steeped in history old and new. There is Grey's Printers shop on the main street where the forebearers of John Dunlop who printed the American Proclamation of Independence came from. Go up to Dergolt and see where the forebearers of President Woodrow Wilson left there for America from his ancestral home. The famous poet and playwright Flann O' Brien came from the bowling green area of the town. The Strabane Workhouse (now the council offices) are located on the Derry Road. These are just a flavour of the distant past. Coming more into the present day we have the sculpture of the Tin Men at the Border Crossing with Lifford. The Old Canal Walkway as well as wonderful fishing facilities along the Mourne from Lifford to Newtownstewart and the Finn to Clady. In the other direction there are horse riding facilities located at Carricklee adjacent to the Herdman house and ground, which were once the scene of the famous Carricklee races held every St. Patrick's Day. For the keen golfer we have Strabane Golf Course located at Melmount and the Hill Valley Course and Driving range at Glebe near Sion Mills adjacent to the town boundary. While Strabane is lacking somewhat in the area of accommodation there is an excellent hotel on the Melmount road called The Fir Trees which caters for the weary travellers. Kelly's Public House on the Derry Road also does an excellent B&B and there are a small number of B&B's scattered throughout the area. I have just given the reader a glimpse of the more hidden gems of this old town and it wouldn't be complete without mentioning that this was the town that created the Irish Show band era of yesteryear with the formation of the famous Clipper Carlton, mostly local lads who made it big at home and abroad. I can remember collecting old coins in my childhood when I was young. This is an interesting hobby I feel when you are growing up. I remember feeling excited on holidays about how old a coin I might buy. I bought these coins of a bygone era at antique shops in Portrush and Portstewart with my mum and dad, this helped to develop my interest in history or after the time of writing. It is every child's dream to buy a coin of George IV from the 1700's for example. Sometimes of course you can't get a coin of a particular reign but you dream of the thrill of landing a Queen Anne penny. The oldest I bought was a Bun penny from the reign of Queen Victoria dating to the year 1890. However as a young adult I feel pleased to have coins of Queen Victoria, George V and George VI. I can remember feeling thrilled knowing that Queen Victoria had the longest reign in British History. I have an Edward the VIII coin - the monarch who abdicated the throne in 1936. My mother was supportive, caring and understanding of my hobby and aim of trying to get my hands on an older one each time. My dad was the same. This obviously started off my interest in Irish Heritage, especially in historical events and archaeology. * Margaret is a member of the Lifford History Links Project Hub, and in this article offers wonderful ideas on how Croaghan Hill can provide a central location for visiting tourists in the future. in this area so that even in death people would still have to raise their heads to look at him. 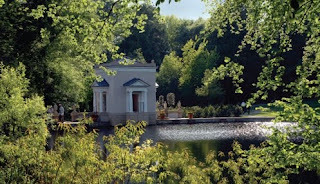 His tomb is known as the Foyde. Dr. Brian Lacey said in a lecture in the Donegal County Museum that Croaghan Hill is as important an archaeological site as Eamhain Macha in Armagh or Tara in County Meath. The pattern of churches and ring forts which always defined the edges of a kingdom spreads out in a circle from this area and we can form a hypothesis that the Cenel Chonaill originated here. The stone structure on the top of the hill is called a Trigonometrical Point and is used for surveying. 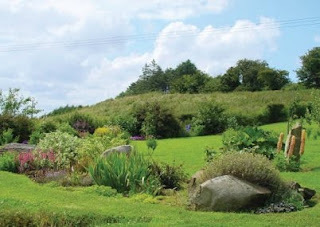 The whole area surrounding Croaghan Hill is famous for its fishing, hill walking, music, dancing, friendly B&B's, home baking and open 'Donegal Gardens' where you can view the flora and fauna of Donegal. 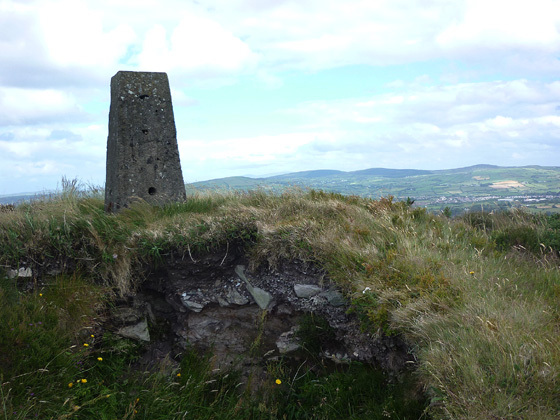 Croaghan Hill overlooks the 'Land of Ithe' which overlooks other History Links Project hubs including Bready, Strabane, Douglas Bridge, Ardstraw, Castlederg and Newtownstewart in County Tyrone, as well as Castlefinn, Lifford, Raphoe and Manorcunningham in County Donegal. These places with their rich cultural of farming, numerous historical sites, ancient churches, stone circles, standing stones, holy wells and mass rocks, a land of myths and legends all interwoven with six rivers; The Strule and Derg which unite to form the Mourne which in turn unites with the Finn, and the Deele, all which flow into the River Foyle. All surrounded by heather clad mountains, fertile valleys and turf bogs. In terms of tourism in the future, from the top of Croaghan (which in the future could possibly be reached by monorail or lifts) or by walking the winding trail you could view the surrounding areas, perhaps with four telescopes pointing North, South, East and West. Visible from this point are the rivers the Mourne, Finn, Deele, Foyle and even Lough Swilly. In a clear day you can see Barnesmore Gap and Grianan of Aileach. From here you could plan your itinerary with the help of the 'land of Ithe' exploratory leaflets and begin your journey into the past while enjoying the present. At Prior School, which I attended for a few years as well, boys and girls had to play hockey, whether we liked it or not. I was one of the ones who liked it. I can't say the same about cricket, I like watching cricket but not playing the game. We went all over Northern Ireland, Donegal and Sligo playing hockey, but we never went down the country. After I left school I joined Strabane Hockey Club and spent quite a few years playing there. I must have been about twenty years old before I started playing tennis in Urney and then in Donaghmore. About the time I started the tennis I also started playing badminton, which I enjoyed very much in Donaghmore. Donaghmore had a church hall where they held socials. The Presbyterians did not allow dancing in their halls. You had the likes of The Siege of Venice and the Waves of Tory. If a dance would happen to start up the minister of the said church had a whistle and all you heard was a few blasts of the whistle to cool things down again. I lived beside St. Pats hall and growing up I would watch all the local girls going into the dance. The glamour of the girls, in their pretty dresses, lovely hair style and nice high heels shoes. I just couldn't wait to be old enough to go dancing. In the late 50s it was in St' Pat's that I learned to dance the 'Slow Waltz', 'Tango', 'Quick-Step', Old-Time Waltz' and 'Fox Trot'. The boys would stand at one side of the hall and girls at the other. When Tommy Mac's band started to play there was a rush of boys across the floor to ask a girl to dance. The dance consisted of three parts, and if the next dance was ladies choice she returned to that boy. Then if he came back to dance with her again and take her for a mineral chances were he would have asked to walk her home. In the early 60's Rock and Roll became phenomenal with Elvis Presley singing 'Jail House Rock', 'Blue Suede Shoes' and Bill Haley singing 'Rock around the Clock' Cliff Richards singing 'Living Doll' and of course the Beatles. Style of dress also changed to the can-can skirt and hair in a pony style and flat shoes were best for jiving in. Some boys wore Teddy Boys suits which were narrow leg trousers with a long jacket, thick soled shoes and a Tony Curtis hair style. The day always started the night before - in the dark, from 8 to 9pm, in late September to November. That night the steam engine (iron wheels) and in later years the tractor, would arrive outside the gate of the farmyard towing the threshing machine and the straw elevator. The farmer would direct the driver to where the sheaf's of cereals would be in large ricks. The threshing machine would be brought alongside the rick and set up correctly. This meant digging holes for the front or rear wheels and placing wedges under the other set. The reason for this was so that the drum (which separated the grain from the straw) would be level. Later models of threshers had rubber wheels and self-leveling drums. After this the straw elevator was brought and set so that the straw was taken to where the rick or stack of straw was to be built. The elevator had six iron spikes attached to wooden lathes, which were attached to chains on either side that moved around on cog wheels. Work was ready to begin at 8am the next day, when neighbours would arrive with their own pitch forks. The threshing took a lot of men, listed here as best I can remember: Usually three or four on the ricks of sheaves (two pitching the sheaves up on the thresher and two pitching over to them). On top of the thresher you had one man cutting the twine from the sheaves and on man feeding the sheaves into the drum. This had to be done head first for good threshing. There would likely be three and maybe four men filling the bags of grain and taking them away for storage. Some grain was kept by the farmer for his winter feed and the rest was taken to either the local mill or a local merchant. Depending on the size of the rick or stack of straw there would probably be four men. Then you had one or two - likely two young lads to haul the chaff out from under the mill. This was a dirty job as the chaff would blow everywhere in your face and hair, especially the barley with its spiky crowns. The owner of the mill would be there to keep the steam engine fueled or the tractor. The tractor pulley had to be lined up perfectly straight in line with the main pulley on the mill, so that the belt would stay on. There would be a space between the tractor and the mill of five to six meters and the main belt had to cover this distance. The threshing would continue through dinner and men would come in to eat in shifts. A barrel of porter was always available and enamel buckets of porter were taken out to the workmen at intervals. An enamel tin mug was provided, this was dipped into the bucket, filled and drunk and handed to the next man. Overall the numbers involved was very high and the women - more likely three to four women would be in the kitchen cooking, feeding and washing up. Total numbers on the farm would be sixteen to twenty men to be fed and probably three women in the house. We always take water for granted, especially in the 21st century, but it was not always the case. I am going to describe the importance of a water diviner in rural Ireland or to give him another name; a dowser. Some of the younger generation would never have heard of a water diviner. When one was looking for a spring (a spring is a stream of water which runs under ground) one would look for a water diviner (some were more skilled than others) having got a reputable one the said gentleman would arrive, wearing a pair of leather soled boots or shoes. He would also have with him a forked stick which was of hazel or black sally. He would then go into a suitable field and the task would commence. Taking about eight yards at a time with the rod, one end of the rod in each hand, held about chest high, he would travel up and down the field. If he struck oil (I mean water) the stick which was held horizontal would point to the ground, it was impossible to hold it in it's original position. He would then put a mark at that place, walk out at right angles from it and start the process all over again to determine the depth of the spring. There was a family by the name of Mc Connell who lived in the Killygordon area, they were all famous as water diviners, some of them moved to Letterkenny and who knows maybe the gift traveled with them. Shallow wells are now a thing of the past. Farmers now call in a firm that bores a six inch hole to a depth of between 200-600 feet and they will guarantee a supply of water. It's a pity the old customs are dying out, but we have to keep up with the times. Where would we be without water. We can survive without food much longer than we can without water. Everything needs water to survive and we do not appreciate it. It's the same water that we use from the day of creation, only that it has been recycled over and over again. We’d have dug sods and built walls for Easter Houses. We got big spruce branches for the roof. 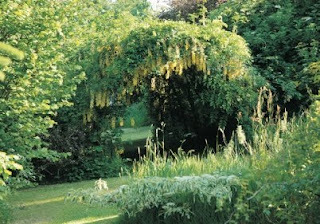 Eggs were boiled with the blossoms off the wind bushes and that coloured the eggs yellow. There were six in the family in our house. We always built an Easter House, but one year it was built early and when it came to Easter we had the fire going to boil eggs, but the wee house went on fire, one of us threw water on the roof and a dozen eggs came out, one of the hens had got into the Easter house and made a nest. We used to make stilts out of bean tins. Syrup tins had a lid and lasted longer. We used to have hens and the clay they walked and rolled and flapped their wings on was really fine like powder. We used to make mud pies and decorate them and leave them out to dry. I remember we got leaflets around the time of the Cuban Missile Crisis telling us what to do in the event of an attack. You were to hide under the stairs, whitewash the windows and fill the bath full of water. We had no running water at school. We used to carry it in buckets. There were two wells, sometimes one was dry and you would have to walk way down to the other. Sometimes the well would be contaminated from the oil of the surface of the roads running off from the road. Sometimes it was drained out and limed. There was a wee forest out the back and we got deadwood from that. We went to Drumlegagh primary school, there was just one big partition in the middle that you’d slide back. It was a church school owned by the Presbyterian church. My father went there as well. There was a place called the creamery beside it and that may have been the school first. When you walked into that school the upstairs rooms were opened up. I remember the big storm in 1947. I was nine at the time. I was caught out the day that storm started. My brother and I were walking from one milepost to another to get milk. There were no milk deliveries then so we had to go to the farmers and buy the milk. It was blowing a blizzard straight into us from the east. We were getting exhausted and we didn’t know where we were. All of a sudden a man appeared in front of us. He had a big coat because he was in the B-Specials and we sheltered in his coat and he walked us back. We still had over half a mile to walk and it was just howling wind. There was a lollipop lady in Ardstraw and she used to walk the kids up over the bridge in a line because there were no footpaths at that time. We used to snare rabbits. We used to set the snares for them. The snares were a brass wire, and my father made his own. There was a man in Tullyrapp and he kept about 20 pet rabbits. He let them out in the field in the morning and went to school, and when he came back he rounded them all up like sheep and brought them back to the house. There were sisters and we slept in the same bed. One night we heard this fluttering and my older sister went mad, and daddy came down with a light but he couldn’t see anything. Then the fluttering started again and carried on all night. The cat came in the next morning and caught something under the stove. We thought it was a bird but it turned out to be a bat! We brought it into school in a wee box and showed it to the class. One night a man was bringing rabbits that he’d snared up to a house and he saw a light coming on the road towards him, and he had to step aside, some of the educated people said it was fire from the bog but this light wasn’t near any bog. There were stories about the banshee as well. It sounded like a cat meowing. If the banshee was heard it was the sign of a death in some family. I remember my father telling us that one night he was going home. He had a bad knee and used a walking stick and it was a grey moonlight night. He saw this thing sitting in the middle of the road, the hair was standing on his head, when he got close enough he hit the thing with the stick and it shot off, it turned out to be his own dog! I remember Hurricane Debbie, I was out felling trees at the time. That day the storm came all the trees were going down. We couldn’t get away quick enough. It started about half eleven in the morning. It started as a gentle breeze then suddenly it picked up! You started Sunday school after you started school. You went on Sunday morning about three quarters of an hour before church. The lessons were put out on cards, you had so many hymns to learn and prayers to learn, then you had an oral exam at the school. If you done well in the exam you got a prize. You got a prize for good attendance, you got a card that was stamped. I worked in Gambles in Killygordan. It was a big going business. They had big bands, people came from everywhere to Gambles. I remember a man used to come in and he used to ask for a ‘cream of the barley and a monk by the neck’ (monk was a beer). It used to be packed out, I was still at school at the time. I got £1 a night, I worked three nights. I worked from 6 until half one, maybe two. Drink was all carried out to the tables there, there was no bar. You counted all the money in your head. They gave you a float at the start of the night, all the money was your responsibility. The guards used to come in but whoever was in the bar was always called ‘staff’, there was always a lot of ‘staff’ whenever the guards were around! My first job was at 14 in Jim Mc Rory’s café at the weekends. That used to big craic. If Jim was in good form the craic was good! He used to make the dinners, cabbage and bacon with a bowl of soup at the start. It was for nothing really he never made any money but he fed half the country. He used to make a big pot of soup in the wintertime and it was good. I worked in the ‘Squealing Pig’ in Ballindrait, I got down by bicycle. It was called after a local man who had a very high squeaky voice after a few drinks. I only worked there at weekends. My first job was in Porter’s spreading cloth. That meant laying out the cloth before it was cut into shapes. A machine went up down the floor and you had walk behind it and level it up. Depending on what the order was. I was there for 19 years. It was a good enough job but you were doing the same thing day in and day out.